Keyport Inserts comprise of a variety of tools and technology you might find dangling from the common keychain. 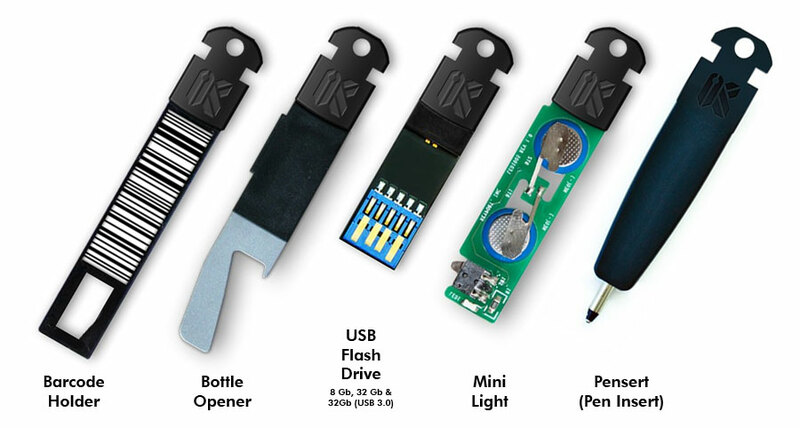 They have a similar form factor as Keyport Blades with their patented one-size-fits all head. Add up to 2 bar codes to per insert. Just cut the bar codes from your existing rewards card key ring tags or wallet sized cards to fit the recessed areas on either side. The bottle opener insert for your Keyport Slide fits in a Keyport channel like a Blade. Just slide it out when needed to crack open a cold one. Keyport's Flash Drives enables you to store, transport and share photos, video, music, documents, and more securely and conveniently from within your Keyport. Keyport's LED Mini-Light insert fits in a Keyport channel like a Blade. To activate the light simply depress the node and slide forward 1/2". The light will remain on.